What's the fastest web browser in the "Real World"? No surprise here – the winner is Google Chrome. According to a report by TechCrunch, the data was collected over a period of a month, capturing 1.86 billion measurements over 200 websites, Google Chrome has been crowned the fastest web browser in the "Real world" by Gomez (Gomez is a benchmarks division of Compuware, it's the industry’s leading solution for optimizing the performance, availability and quality of web, non-web, mobile, streaming and cloud applications). For page load time, Google Chrome 12 (3.43 seconds) was about a half-second faster than its nearest rival, Firefox, with Safari and IE another half-second behind. On the high end is Apple’s Safari 4 (6.149 seconds) and IE 7 (6.006 seconds). 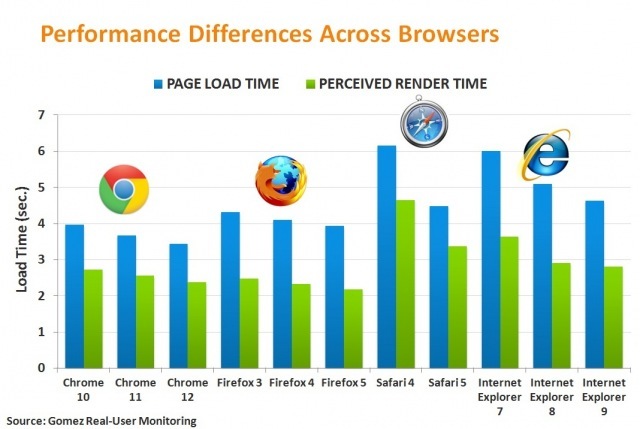 For perceived time, Firefox 4 (2.18 seconds) edged ahead of Chrome. Google Chrome Blog: Faster than fast - Well, you might have to wait for Instant Restaurants and Instant Elevators, but Instant Pages is available today in the latest beta release of Chrome. Thanks to Chrome’s new prerendering technology, some Google.com search results will appear to load almost instantly after you click on them. How to increase browsing speed: 7 ways to work faster on slow connections - Ever wonder how to make your Internet connection faster or how to increase browsing speed? If you are trying to get things done, there is nothing like a slow connection to thwart your best efforts. But there are things you can do to browse faster—even when your Internet connection is working slowly. 12 Tricks To Increase Your Firefox Speed By A Noticeable Amount - With this tutorial you will be able to explore the hidden speed of Firefox which will boost the speed of Firefox and make your Firefox much more faster. That is so important, speed... is it 0.3 or .05 seconds before you see the page :o) To me most important thing is security and feel of the browser. Thats why Opera, an excellent browser but it is just to much going on. Chrome from other side is clean, simple but include all I need. Opera is fast too. I cannot tell which one is faster between chrome and opera. But only fast speed is not enough. We also need some build-in and helpful features (Add-ons just slow my browser or even the whole computer). That's why chrome and opera are fast but I still use a small Avant browser. My problem with Opera is that it starts slowly compared to Chrome. It got like no security ever, while Chrome got Sandboxing and is soon introducing NACL. I think I will stay with Chrome for a while. I agree. Chrome is the best browser. And Andrew, will you ever use Disqus as the commenting system. Check them out www.disqus.com. Disqus is used by Engadget, IGN, CNN, and others. I would consider looking at this. Hi Michael, Thank you for your message. The CMS of this site is developed by my self. I have no plan to use Disqus. I have tested IE, MF, op, and chrome together. And chrome was 1 of the fastest.